Security rules are used to build the Spring SecurityFilterChain which is used to filter incoming requests. By default, MOTECH blocks access to any resources if you are not logged in, therefore, accessing any URL will redirect to the login page. If you need an endpoint using a different configuration, you must add a new rule or edit an existing one. You can specify the order of processing using the priority parameter. Rules with greater priority will be checked first. In case of conflicting rules, the ones with higher priority will block the ones with lower priority. In this case it is worth considering to use more accurate URL patterns. It is very helpful for a hierarchy model of urls. When you are using permission access with user access in one rule you must know that these options operate separately. For example you gave User access to sampleUser and Permission access to viewSecurity permission. Access to the endpoint will be granted to sampleUser and each other user with viewSecurity permission. If resources are protected using @PreAuthorize annotation you must remember that NO_SECURITY schema will not work because access to these resources will be granted only to users with respective roles. If other schemas are used, the user will still have to have the appropriate roles. The value of the rest option is important, you must know that if it’s true then only NO_SECURITY and BASIC schemas will be supported. Before saving configuration remember to check the correctness of the settings, because you can lock yourself access to change them or you could provide access to the whole system. If you have lost access to the system, read the information on regaining access, due to incorrect security rules configuration. If you want edit those settings via GUI, your user account must have viewSecurity and updateSecurity permissions. To open the configuration you want to select ‘Manage dynamic URLs’ option under Security tab in the Admin panel. You should see a list of all security rules. When you start editing or adding a new security rule form will expand and you will see options that were described earlier. To activate current configuration you must save changes. 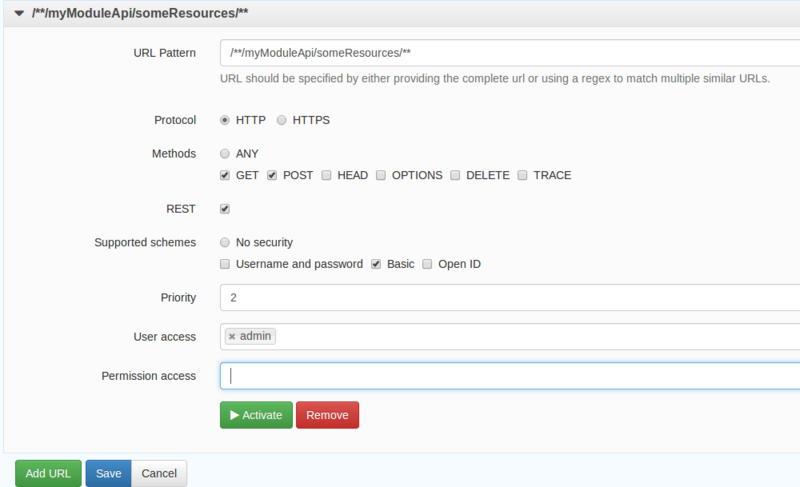 You can add rules to your module using configuration files. To do this you must create a file named securityRules.json and place it in the resources directory and then build the module. Security rule configuration files are discovered automatically by MOTECH when the module starts. To regain access to MOTECH, restart it. When server starts, default platform rules are always reloaded so it may help you regain access. If that doesn’t work you should try drop database table holding security rules or delete only rules that block access.